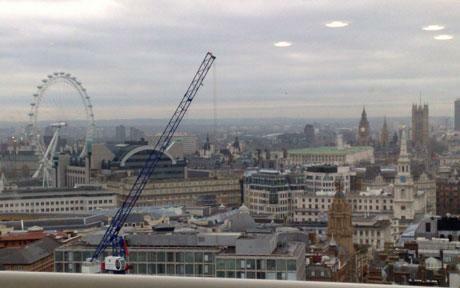 Strange shapes have been photographed hovering over London leading to speculation they could be UFOs. Mr Burdon took the photographs 16 floors up on the roof top of Orion House in Covent Garden in the morning. Although invisible to the naked eye, the shapes can be clearly seen on the picture. Derek, 40, of Leverington, Cambs, said: "We couldn't believe it when we came to look at the photo. I just thought I would take some scenic shots of the London Eye and also Big Ben. "There was nothing unusual in the photo and it was only when we flicked through them later that we saw them and then it started a big UFO debate. "I have not tampered with it and you would not be able to fake it. It was taken on my mobile and I guess I am just lucky to have it. These shapes were not visible to the naked eye so it's not as if I was looking for them." In Feburary video footage of a UFO hovering above the British coastline was captured by holidaymakers in Somerset. Caravaners were left baffled when the mysterious cylinder hovered over a busy campsite in Brean, Somerset. But experts dismissed the strange moving shape as a weather balloon.